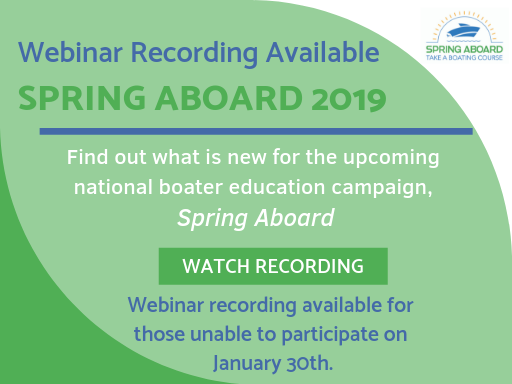 Learn about some exciting changes to the Spring Aboard campaign for 2019. You'll get the first look at the campaign's brand new website. We'll review the details of our first-ever Spring Aboard contest and talk about what it means to become a featured partner. We'll also go over the resources we're making available - like suggested social posts and our new Instagram account - and how we're making it even easier to help promote the campaign in all the ways that are right for your organization. Learn how you can help us spread the word about Spring Aboard and how to Keep Your Edge in 2019 - Take a boating course and learn something new. Spring Aboard: Take a Boating Course is a national campaign to inform and motivate boaters to prepare for the boating season by providing information on how to find and enroll in boating courses of all levels. The campaign runs for one week: March 17-23, 2019. The campaign is sponsored from a grant from the Sport Fish Restoration and Boating Trust Fund administered by the U.S. Coast Guard. Copyright | 2019 NASBLA-Spring Aboard | All rights reserved.